Imagine a worst case scenario, something you would read in a Michael Crichton novel. After coming out of a period of minimal solar activity, the sun erupts with a solar flare of unimaginable magnitude. 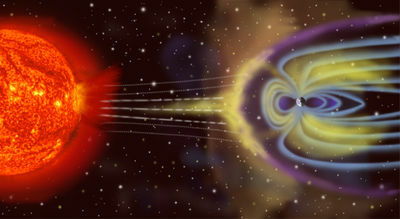 From this flare comes a silent, invisible Super-storm, called a Coronal Mass Ejection. This CME speeds towards the earth at over 500,000 miles per hour and washes across the earth’s magnetic field a mere 18 hours later. 50% of the satellites in orbit, those not protected by the body of the earth, shudder with the geomagnetic storm and then go silent, disrupting cell phone traffic across the globe end rendering much of the GPS network inoperable. On earth, the storm causes Aurora, much like the Northern Lights, that are visible as far south as San Juan. Energy is almost visible to the human eye as the atmosphere literally hums with the power. As the pulse touches down on the world’s electrical grids, no one can imagine the speed at which our fragile wire-based infrastructure collapses…a massive chain of transformer and power station explosions rock the country. The energy companies tell us it will take 20 years to restore power to 90% of the planet, due to the complexity and lack of capacity to build new transformers, if the parts can even be fabricated in our sudden electricity-less world. Of course this scenario is unlikely, farcical even…or is it? The exact event I described, minus the effects on our current world, occurred in 1859, and is called the Carrington Event. On September 1–2, 1859, the largest recorded geomagnetic storm occurred. Aurorae were seen around the world, most notably over the Caribbean; also noteworthy were those over the Rocky Mountains that were so bright that their glow awoke gold miners, who began preparing breakfast because they thought it was morning. Telegraph systems all over Europe and North America failed in some cases even shocking telegraph operators. Telegraph pylons threw sparks and telegraph paper spontaneously caught fire. Some telegraph systems appeared to continue to send and receive messages despite having been disconnected from their power supplies. While I preach that our preps should be based real-world likelihoods, the fragility of our electrical grid would make a storm of similar magnitude to what occurred in 1859 a catastrophe of Biblical proportions. Most areas of the world in the 1800’s knew at least something about food production, carpentry, cobbling, coopering and a hundred other skills that we have lost in our specialized societies. While specialization has led to booming living standards, it comes at a cost…brittleness. Meaning, if everyone knows how to farm, the loss of any particular farming area or piece of equipment, while tragic, would likely be insignificant to the world’s food supply. However, imagine that our entire method of farming, from industrial fertilization to high-capacity farm machinery, is rendered a total loss to the collapse of our electrical infrastructure. That is another story entirely, and would require the remaking of our world. Most here by now know I’m not a fatalist. I prepare for things like tornadoes, job losses, and floods, not for EMP’s, nuclear war, or Zombies. However, there is always a little tickle at the back of my skull that whispers of my lack of preparation in one particular area: water, and what would occur if something truly monumental occurred. You all know the deal with what I consider the 5 musts of preparedness: Water, Food, Shelter, Fire, Light. However, while I’ve harped to my preparedness group (I affectionately call it SurvivalClub) for over a year about our lack of water preps, they are woefully inadequate. We have over 10 person-years of food stored, multiple locations we could head to for shelter (plus a dozen tents and tarps), 50 ways to make fire, probably 500 flashlights, candles, lanterns, torches, flares, glowsticks and headlamps. All that, and we have less than 10 days worth of stored water, and very little planned in ways to get more. Sure, we have water filters, ways to boil water, iodine, bleach, pool shock and several other ways to make water pure. However, unlike the other areas, we don’t have a real plan. So, having gotten tired of listening to me, our group has finally taken the first concrete steps toward a real water solution. We came up with the SWP, the Survivalclub Water Plan. The plan had several requirements: it needed to work without electricity, had to be able to support 20+ people, and had to run with a minimum of moving parts that could break or wear down. I don’t remember which of us actually first read about a ram-pump, but when we all saw it, we knew that was the solution we were looking for. Tomorrow, we’ll discuss the ram-pump, how it works, and the components of our complete system. Well, I always wanted to be a place folks could rely on to get their food storage stuff. However, you may have noticed last month I ran out of 2000cc Oxygen Absorbers. The day the shipment was to arrive in our warehouse I called my main supplier to ask why it didn’t arrive. Only then did they tell me the order hadn’t even shipped. Worse, they said they were out of stock, and no one knew for how long (Yet they cashed my check while I’m still stuck waiting, more than a month later). I started subbing larger quantities of 300cc absorbers for the 2000’s, and while not optimal, that was working ok. However, I went to place my order on Friday of last week for 300cc absorbers with my 2nd supplier, and they let me know they were out of stock as well and a new shipment wouldn’t arrive until the 2nd week of April. UGG! Exacerbating the whole supply issue is the Tsunami in Japan which occurred on Friday…I am lucky I was off from my day job, as we did triple our average volume of sales as people started to stock up in the wake of the disaster. However, it nearly wiped out my stocks of larger absorbers (we still have 100cc absorbers remaining), and I will have used up the remainder by tomorrow. In any case, I am here to let you know we are essentially out of stock of both 2000cc and 300cc absorbers for the near future. I am trying to place a 300cc order with another supplier right now, but they can’t yet give me any indication whether they are in stock or if it will occur. I called some other suppliers as well, but they wanted so much that I would have to raise my prices more than I am willing to. You all have my deepest apologies. If there is any silver lining to this situation, it is that while I am out of stock on these items and not shipping many orders, I am going to work on the new e-commerce ordering system, listing some items I haven’t gotten to (buckets, Gamma Seal Lids and some Rothco stuff), and otherwise improving the back end of the business which has been left wanting as our order volumes increased dramatically. Oh, and I am still fully stocked on Mylar bags (we actually got a new shipment of bags in this week, and they are beautiful; I am ultra happy with a new supplier), including the large 5-gallon Zip Seal bags. The ongoing Chilean Mine Disaster presents us with a first-hand look at some ways to stay sane and functional during an almost impossible circumstance. First, work at keeping your spirits up. 2nd, keep focused and develop a plan. And finally, develop a schedule that presents a sense of normalcy. At In Case of Emergency, Read Blog, John Solomon offers some of the more insightful commentary on citizen preparedness I’ve read. Today he offers an article on the role of personal responsibility in preparedness. For much of the preparedness community, he is preaching to the choir (granted, we’re not his target audience). However, his thorough research, focused writing, and straightforward style strikes all the right notes, and I recommend spending some time on his site. He is working on a book due out in 2011; I look forward to reading it. You are currently browsing the archives for theDisasterscategory.